While many large religious organizations in the United States allow women to be ordained – and to hold leadership positions within the organization – few women have actually served at the very top. We looked at nine major religious organizations in the U.S. that both ordain women and allow them to hold top leadership slots. Of those organizations, four have had a woman in the top leadership position. And, so far, each of these four has had only one woman in the top position. 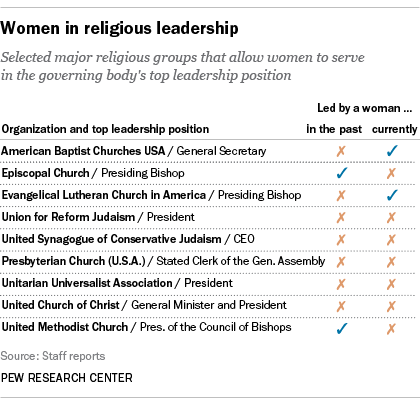 Currently, the American Baptist Churches USA and Evangelical Lutheran Church in America are the only groups in our analysis with women in their top leadership positions. Susan Gillies is interim general secretary of the Baptist churches and Elizabeth Eaton is the presiding bishop of the Lutheran group. The Unitarian Universalist Association has had women running in the past three elections for president, but, so far, no woman has won. This year, there are two women candidates. The Union for Reform Judaism, the central leadership arm of Reform Jewish congregations in the U.S., has never had a woman president. However, a woman, Denise Eger, serves as president of the Central Conference of American Rabbis, the principal organization for Reform rabbis in the U.S. Additionally, another woman, Daryl Messinger, is the chair of the North American board of trustees, which is the top lay leadership post in the organization. Likewise, the United Synagogue of Conservative Judaism has never had a woman as its CEO, the professional leader at the head of the organization. However, a woman currently holds the office of the international president, a lay position. Margo Gold is the second woman to serve in this capacity. Many churches, including many of the largest denominations in the United States, such as the Roman Catholic Church, the Church of Jesus Christ of Latter-day Saints (LDS) and the Southern Baptist Convention, do not allow women to be ordained or hold top church leadership positions. In recent decades, there have been efforts among some American Catholics to lift the church’s prohibition on ordaining women. More recently, some members of the LDS church have advocated for the ordination of women into the priesthood, an office held by most adult Mormon men who are members of the church in good standing. While roughly six-in-ten American Catholics (59%) in a 2015 Pew Research Center survey said they support ordaining women in their church, 87% of Mormons (including 90% of Mormon women) in a 2011 Pew Research Center survey said they do not support allowing women to enter the LDS priesthood.